Are you looking to change the font of your website? The bad news is that by default there are less than 20 “web-safe fonts”. A web-safe font is a font that will display consistently no matter which device or operating system your users are viewing your site on. This matters, because while you might have a great font such as Franklin Gothic installed on your system. If you choose to use that font on your website, and your users don’t have it on their systems, then they will see a less-great fallback font such as Arial instead. Fortunately, there is a solution. Google Fonts is a collection of free, open source fonts that when installed on your website will display consistently across all devices. 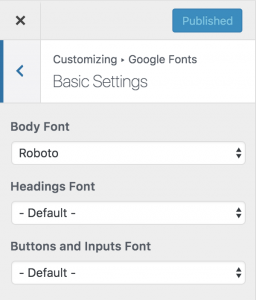 Once you’ve installed the plugin simply navigate to the customizer (Appearance → Customizer) to begin choosing your fonts. When you choose a font the plugin will instantly show you a live preview of how it will look on your website. Then once you are happy with the changes you can ‘Publish’ them. The ‘Basic Settings’ control panel allows you to change the essentials: Body Content, Headings and Inputs. Will the plugin work with my theme? Yes, the plugin is coded in a way that it is compatible with 99% of themes.